That sneak peak was mean wasn't it? Here are the finished products. We are having our second Aqua Apron Sisters events for one of our own. The gender of this little one is a mystery which makes planning shower a fun challenge. I found the idea here (I can't resist borrowing one of the best invite ideas ever) months back and was just waiting for one of my friends to get pregnant so I could use it. Alicia and I stayed up late chatting, cutting, sewing and gluing and we are so thrilled with the end result. i am so using this idea! i like yours better the fabric choice, the shell buttons oh my goodness!!! Yeah...SO super cute!! I agree...your version is cuter!! Sorry, is that mean to say? My name is Sharla, and I am the owner/designer of "Vintage Momma" (custom - handmade jewelry) I currently and selling locally and on Etsy-- vintagemomma.etsy.com. I found your site through Mama Manifesto Blog. I have been talking with Kristen about reviewing my designs and she mentioned how much she enjoyed you and your blog. Thought I'd come say hi! Just a couple of clicks and here I am! I love your site!! I am a mom to three little girls (4.5, 3, 16 mths. ), and we live in the Houston, TX-area. I was hoping to possibly send you some of my jewelry (for yourself!! ), as well as to "review and recommend" (if you feel like you could endorse it), and for some giveaway's to your readers. I try to use the most natural materials possible, and reuse/recycle/upcycle as much of my product, without sacrificing any quality. Also, 5% of ALL my sales go to Haiti Rescue Center (several of our friends are adopting from there), and 5% goes to Susan G. Komen Breast Cancer Assoc. (my 39yr. old sister has battled and beaten breast and brain cancer in the last year, and this is in honor of her). I think these things would be in line with a lot of your readers values (from what I have read in your posts and their comments). I hope this is not too long-winded...just wanted to share everything with you and get your feedback. I'm SO excited to have found 'Joy's Hope'!! i also have been waiting for someone to get prego so i could make those invites. the fabric you chose is adorable! Oh my gosh I love this!! I forwarded it to my mom who is throwing a shower and she love them too so I offered to make/help make them. I can't wait! I like yours better than the originals too. That fabric is perfect and so much fun! that is so cute!! so using this idea!! I absolutely LOVE those!!! SO CUTE! I am a recent finder of your blog and love it, you are so talented! 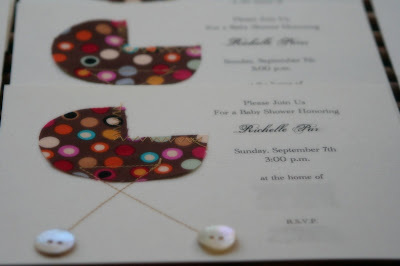 I love these baby shower invites, I will be using this great idea someday too! Very cute! And that's really thoughtful to handmake the invitations. They will be a great keepsake! Your invites turned out SUPER cute... I am keeping that idea on file there are a few babies coming our way! Thanks for sharing! These are tooo cute! I love them! This is definitely worth saving in an idea book.